Hafthor Bjornsson is the World’s Ultimate Strongman. The Icelandic superstar beat off competition from the very best in the world to lift the inaugural WUS title at the Bab al Shams Arena in Dubai on Friday. This crowns an incredible 2018 for the man known as the Mountain from Game of Thrones as he adds to his World’s Strongest Man, Arnold Classic, and Europe’s Strongest Man victories. Along with the prestige of winning the first hosting of the event, Bjornsson collected prize money of $70,000 – the biggest purse ever for a strongman event. It wasn’t all plain sailing for the man who tips the scales at over 200kg however. 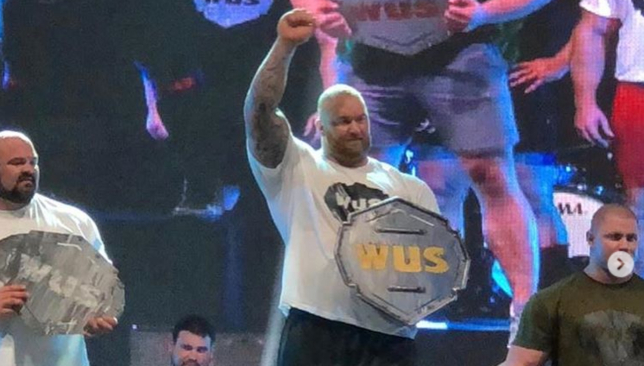 The six-foot eight-inch tall Bjornsson found himself outside the top three after the first two events, but was in devastating form over the final four, eventually taking the title by two and a half points from US-rival, and four-time World’s Strongest Man, Brian Shaw. Bjornsson had been content with his truck pull, but had slipped out of the placings after the arm over arm pull. However, it was a spectacular performance in the silver-dollar deadlift that truly sparked his competition into life. He lifted an incredible 520kg, matched only by eight-time Canada’s Strongest Man, JF Caron. The feat was just 16kg short of the world record set by Eddie Hall. Next up was the overhead medley, four devastatingly heavy objects to be pressed above the head – a 160kg log, 100kg dumbbell, a 160kg axel, and a 140kg shield. Having watched most of his contemporaries struggle to complete the course, Bjornsson powered through it with relative ease to take maximum points and put himself in the box seat. From here came the 580kg yoke carry. Britain’s Laurence Shahlaei, a yoke carrier of real pedigree, had set the time to beat on the event with a rapid run, as again many of the other competitors struggled to complete the course with such a heavy object. Bjornsson was up against Poland’s Mateusz Kieliszkowski in the final heat of the event. Kieliszkowski has placed fourth in the last two World’s Strongest Man events, and is known for his speed and athleticism despite his huge size. The pair would be neck-and-neck along the course and eventually joined the Englishman Shahlaei in the top three for the event. 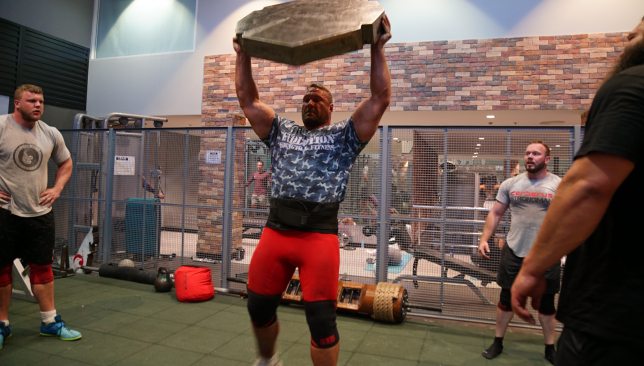 This gave Bjornsson effectively an unassailable lead going into the final event – the Atlas Stones. Again this was the heaviest run of stones ever seen with the heaviest of the five being a monstrous 225kg. Scotland’s Tom Stoltman was the only man to have completed all five going into the final pair – Bjornsson and Shaw. While Shaw would rattle through them, the Icelander would take his time knowing four stones would secure the victory. He duly completed four to lift the title. The eagerly anticipated World’s Ultimate Strongman takes place this weekend with organisers promising fans a show like nothing they have seen before. The event is a unique fusion between sport and entertainment with the showpiece being a strongman content featuring the very best athletes in the world vying for the biggest purse the sport has ever seen. Athletes have already said the event, appropriately named Beasts in the Middle East, is changing the face of strongman globally, with new levels of professionalism, organisation, and treatment of the athletes – now the public will get the chance to see it first hand. The line-up reads like a who’s who of the strongman world, headlined by current World’s Strongest Man, Hafthor Bjornsson – The Mountain from Game of Thrones. He will be joined by former WSM winners Brian Shaw, and Zydrunas Savickas and a host of other top names. The event is something for the whole family, with a host of other activities taking place throughout the day including a bench press competition, search for the fittest human, UFC exhibitions, Shaolin Monks, Capoeira dancers, obstacle courses, skate parks, a gladiator entrance parade and so much more. Don Idrees, owner and producer of the show alongside Mark Boyd says months of hard work is now coming to fruition. 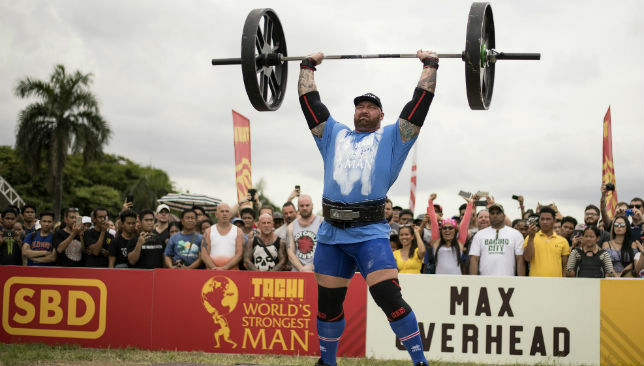 He added World’s Ultimate Strongman is changing the face of future events. As for the event, Don is convinced his team has developed a concept that will live long in the memory. “The format we have created is actually targeting someone who doesn’t even know what strongman is. We have packed the world’s biggest strongman competition in a new concept fusing sports and entertainment that appeals to a wider public. “Seeing is believing with these guys and what they do – and that’s how you create a strongman fan. Terry Hollands trains ahead of World's Ultimate Strongman as Luke Stoltman, Mark Boyd and Robert Oberst look on. The strongest men in the world will gather at the Bab al Shams Arena on Friday in an event that fuses sporting competition with family friendly entertainment and activities. Strongman is still a relatively low-profile sport, despite the athletes performing super-human feats, but World’s Ultimate Strongman (WUS) is looking to change all aspects of that from the marketing and delivery of the event to how the athletes are treated and how much they are paid. Fourteen athletes will take part, including three World’s Strongest Man winners, across six events that will test them more than ever before. Robert Oberst, Terry Hollands, and Tom Stoltman arrived in Dubai last week and have been taking in the sights along with a number of promotional activities. Sadly, Oberst won’t be competing as he continues to rehab a bicep injury, but is still still exited as to what the event will hold. “It’s pretty cool to see it all coming together, the guys are excited, the city is excited, I’m looking forward to see what happens,” he said. “I think it’s going to be something we remember for a long time. “This is very different to anything we’ve ever done. This is going to change the future of strongman a lot, people are going to have to compete with this – if you want to be the best show in the world you have to beat this one. Terry Hollands is a veteran of around 250 competitions, and says he has never seen anything like this. “This is raising the bar for strongman,” he said. “They have made such an effort with the show, the entertainment, and everything else that is going on around it. It’s great for the sport. “This is next level, the way we are being treated, we’re in an amazing hotel, food is all provided, prize money is better than we have ever had, the arena is amazing, the equipment looks great – we can all see it is something that is going to be great for strongman. “Sometimes it takes someone to raise the bar for everyone else then to follow suit. He also encouraged people to witness the spectacle for themselves. Supported by the Dubai Sports Council, WUS will headline with the strongman competition, but the huge arena will be full of other activities – you can see just a selection of them here.